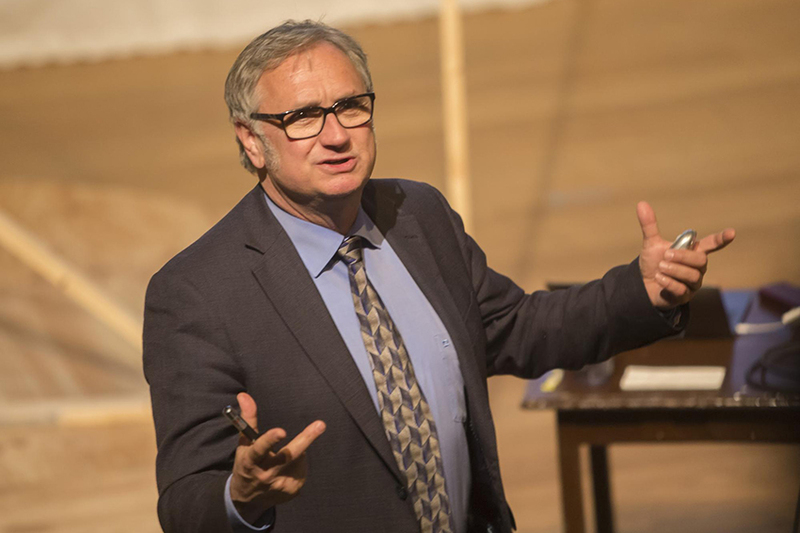 Dr. Jeffrey Reimer, Chair of Chemical and Biomolecular Engineering at University of California, Berkeley, was this year’s fifth and final Senior Humanities Program speaker. 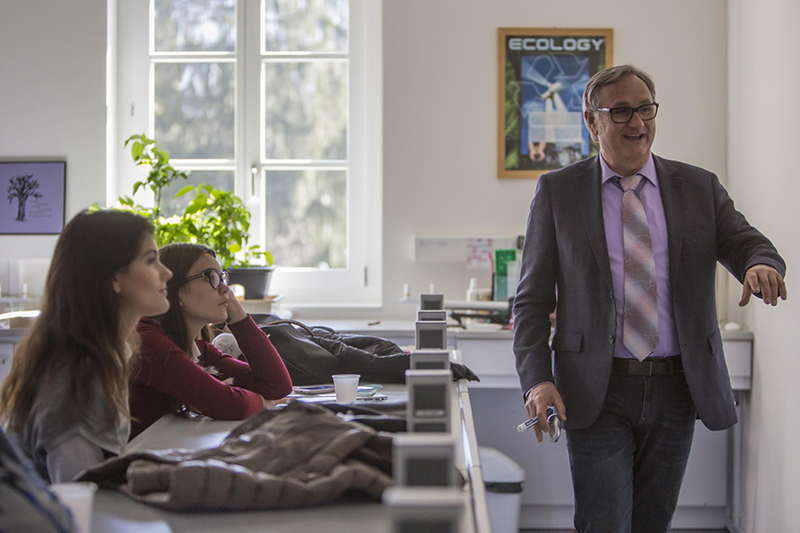 Dr. Reimer spent time with students in a number of science classes—Ecology, Biology, IB Environmental Systems, and IB Chemistry—during the course of his two days on campus, and he also addressed the entire senior class in the Palmer Center on the evening of March 13. Entitled "Scientific Evidence Demands a Verdict: Our Changing Climate,” Dr. Reimer’s address centered on the idea that many of his students and his colleagues in education are aware of climate change only through public discourse and social media. Drawing on recent scientific papers developed for a course he teaches at Berkeley, Dr. Reimer demonstrated to TASIS students how the atmosphere is changing, how humans are the cause, what the consequences are, and how these consequences may be viewed in the context of Earth’s historical carbon cycles—cycles that demonstrate well what the Earth will look like unless we consider every possible means to decarbonize the atmosphere. Particularly interested in carbon capture and sequestration, Dr. Reimer concluded his talk by showing that carbon capture is becoming increasingly feasible. Dr. Reimer was born in California and received his bachelor’s degree with honors from the University of California at Santa Barbara. He obtained his doctorate in Chemical Physics from the California Institute of Technology while working with physicists from Xerox PARC to examine the chemistry and the physics of solar cell materials. Prior to his appointment at Berkeley, Dr. Reimer conducted basic and applied research in semiconductor science and technology as a postdoctoral fellow at IBM Research in Yorktown Heights, New York. He earned a Presidential Young Investigator Award and the Camille and Henry Dreyfus Teacher-Scholar Award during his early years at Berkeley. After receiving tenure in recognition of his contributions in applying magnetic resonance spectroscopy, he was named the R.W. Vaughan Lecturer at the Rocky Mountain Conference on Analytical Chemistry and Applied Spectroscopy. Dr. Reimer was named a Mercator Professor of the Deutsche Forschungsgemeinschaft (DFG) at RWTH Aachen University while on leave from Berkeley in 2006. His work on applying spectroscopy to problems in materials chemistry and physics led to his election as a Fellow to both the American Association for the Advancement of Science and to the American Physical Society. In 2012 he received the Eastern Analytical Society award for outstanding contributions to magnetic resonance. The Senior Humanities Program (SHP) draws from five defining elements of the TASIS identity—truth, beauty, goodness, international understanding, and humanitarian action—to provide seniors and postgraduates with a signature educational experience. Students enhance their intellectual experience through discussions, trips, lectures, and tours focusing on these five elements, and the year-long program conveys a clear message to seniors and postgraduates about what the School hopes for and expects from them after they leave TASIS. Chaired by English Teacher and 11th/12th Grade Dean Peter Locke, the SHP Committee selects five speakers each year who exemplify the pillars of the program. This year’s lineup opened on October 24 with a visit from journalist John Hooper. Humanitarian Heela Najibullah spoke on November 7, filmmakers Zach Ingrasci and Chris Temple visited on January 19, and writer and educator Steven Hahn addressed the senior class on February 21. Mr. Locke, who began chairing the SHP Committee in 2012, feels that this year’s roster was especially strong. "The 2016–2017 Senior Humanities Program speakers turned out to be one of the most successful groups in recent memory,” he said. “Not only did we enjoy a diversity of expertise among the speakers on this year's slate, but we were also blessed to host presenters who were excellent with high school students. Hearing from humanitarian workers, journalists, scientists, and storytellers, the Class of 2017 was exposed to the best of what the TASIS experience has to offer: truth, beauty, goodness, international understanding, and humanitarian action. As the seniors head out into the world next year we hope those five values will resonate with them and inform the studies and vocations they pursue."